CLEVELAND — President Donald Trump said Saturday "we want to make everything here" as he promoted his "America First" agenda during an appearance in Cleveland, days before the state's primary election. Trump spent several hours in Ohio meeting with supporters and participating in a roundtable designed to highlight the benefits of the new Republican tax law. Striking a celebratory tone, Trump listed his poll numbers and recounted the successes of his first year in office. He also looked ahead to his meeting with North Korea's Kim Jong Un. "We have the time and place all finished," Trump said, but he wouldn't predict the outcome of the talks, saying, "we'll see what happens." Trump criticized U.S. immigration policy, saying people entering the U.S. illegally are taking advantage of "catch-and-release" practices and don't show up for their immigration court dates. He said: "We may have to close up our country to get this straight." He also said U.S. protectionist trade policies and his more isolationist policies would benefit Americans. Trump pledged a strong stand on trade to achieve "a level playing field," saying that "other countries, they put themselves first. ... The fact is we want to be first." "We'll be taking care of our people," he added. 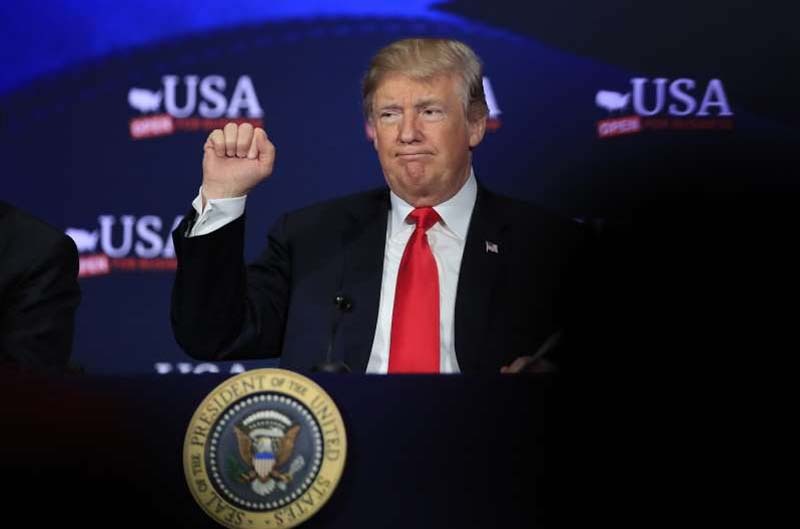 Trump also attended a fundraiser for Trump Victory, the joint committee funding his campaign and the Republican National Committee, meeting first with high-dollar givers and then addressing a larger group of about 250 donors. The RNC said Trump raised $3 million during the events. Trump sought to boost Republican lawmaker Jim Renacci in his bid for the Senate, saying "we need his vote very badly." Renacci, a member of the House, is running for the Senate against Democratic incumbent Sherrod Brown. Trump predicted: "He'll be fantastic." At the official taxpayer-funded event, Trump also criticized Brown, saying he shares Democrats' "deep-seated" support for what he claims are looser immigration policies. Renacci greeted Trump on the tarmac in Cleveland and was seated next to the president at the event. Trump's visit comes as Republicans are facing an increasingly challenging midterm election environment. Ohio has several competitive races this November. The GOP is placing its election hopes on convincing Americans that the tax law is improving their lives, as the party seeks to skirt political headwinds emanating from the White House.